This article was written by Stan Carey for the Galway Cycling Campaign. A version of it was published by the Galway Independent for its ‘Inside Out’ column on 4 June 2014. People sometimes ask why I cycle around Galway when I have a car, and I’m surprised the answer isn’t obvious. Then I remember there are lots of answers. Cyclists are commonly stereotyped – as lycra-wearing fanatics, cardboard-eating eco-warriors, etc. 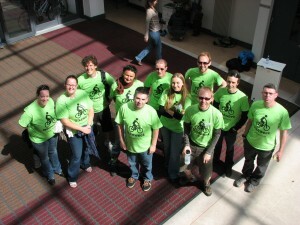 – but we’re as diverse as any random group of people, and we have countless reasons for cycling and styles of doing so. One thing that puts people off is the perceived danger, but cycling is a lot safer than it’s made out to be if you have the right skills. And it becomes safer with numbers. All road users need to share the roads respectfully, and above all be patient. Overtaking a cyclist dangerously just to save a few seconds is a nasty thing to do, illegal too, yet it happens all the time. I don’t care how much of a rush you’re in, your time isn’t worth putting someone’s life and well-being at risk. Not that cyclists are immune from bad behaviour. I see examples every day – like footpath cycling, which I don’t mind when it’s a child or learner taking their time, but when it’s an able-bodied young male zipping by makes me want to lecture and fine them on the spot. Still, it’s nothing to the danger posed by driving at speed, which is rife and inadequately enforced and has helped decimate the number of children and families cycling on city and rural roads in Ireland. Galway’s size and layout are well-suited to getting around by bike or foot. The city has a proud tradition of cycling, and it wouldn’t take much to make bikes a strong part of its culture again – a bit of promotion, know-how, and political will. The upcoming Greenways and Coke Zero bike rental scheme should help normalise and boost cycling again, following the great successes in Mayo and Dublin. Like learning to drive, it’s hardest when you’re starting. How can beginners and nervous cyclists develop the confidence and skills to manoeuvre roads that seem so hostile? Know your bike and your capabilities, for starters. Watch and learn from experienced cyclists. Get a copy of the Galway Cycling Campaign’s “Cycling Skills” leaflets, or read John Franklin’s book Cyclecraft in the city library. And practise. It takes time to learn how to read the roads, to anticipate threats, to know when it’s safer to use the centre of a lane and when to keep in. Just give those car doors a wide berth. Less obviously, cycling brings a real physical quality to a journey. Instead of being cut off from the world around you, you’re immersed in it. You can enjoy its sights and sounds and take in the scenery Galway is blessed with. Feel the sun on your face (if there is any), the wind in your hair (if you have any), the joy of freewheeling downhill. You can stop on a whim to look at something or chat to someone you know. And when you get home you have the satisfaction of having exercised and gotten a good dose of fresh air. Even the weather’s not as bad as you’d think. A new bicycle commuting service is coming to Galway during National Bike Week. For two days of National Bike Week, Monday 16 June and Wednesday 18 June (National Cycle to Work Day) the BikeBus will provide adult cyclists in Galway with the opportunity to commute to work with other cyclists. A BikeBus is a collective form of bicycle commuting where a group of cyclists follow a set route and timetable, “picking up” and “dropping off” “passengers” along the way. A BikeBus provides those new to bicycle commuting with a perfect opportunity to commute to work alongside experienced cyclists. The BikeBus also welcomes experienced cycling commuters who may fancy a more convivial ride for the week that is in it. The BikeBus is a fun, healthy and sociable way to get to and from work. We’ve put together a set of FAQs for BikeBus. Make sure you check the route map and timetable below to “catch” the BikeBus. 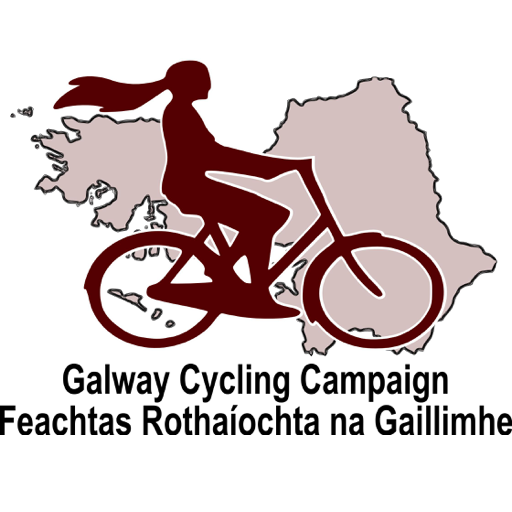 Email info@galwaycycling.org to let us know if you want to “get on board”. Don’t cycle on the footpath: Obvious, right? Adults cycling on footpaths is an issue that annoys, threatens, intimidates and upsets a lot of pedestrians. While some cycle in a restrained manner, others cycle on footpaths in wholly obnoxious and selfish manner that destroys public sympathy for cycling and cycling promotion. In the Galway Cycling Campaign we’re fully aware of this and we hold the firm position that the footway is no place for an adult cyclist (we don’t hold a hard view on children cycling on footpaths). As it happens our national body, Cyclist.ie, favours the consideration of German type traffic laws that allow for children cycling on footpaths. With adults, much footpath cycling is percieved to be a reaction to hostile road conditions rather than simply wilful lawbreaking. The solution for adults is to acknowledge the problems footpath cycling can create and work to ensure that cyclists have access to a roads network that recognises their needs as roads users. We’re happy to see the law on footpath cycling enforced by An Garda Síochána as part of a range of enforcement measures needed to create a more people-friendly city. We advocate our position to fellow cyclists and we raise the issue when talking to engineers and designers of infrastructure. One of our concerns on the Seamus Quirke Road fiasco is that the design of the off-road cycleways puts cyclists into conflict with pedestrians. It is an approach that the city council want to continue in future schemes. We believe that the law informs our position. Here’s the legislative background to this. 1. A bicycle is a vehicle under Irish Road Traffic legislation. These are important definitions, the first three relate to the cyclist and their bicycle and how they are viewed as a driver and a vehicle respectively i.e. the law applies to them in a similar manner to those applying to a motor driver and a motor vehicle except where stated otherwise. The last relates to what we typically refer to as a footpath; a footway. 13. (1) Subject to sub-articles (2) and (3), a vehicle shall not be driven along or across a footway. (2) Sub-article (1) does not apply to a vehicle being driven for the purpose of access to or egress from a place adjacent to the footway. (3) A reference in sub-article (1) to driving along or across a footway, includes s reference to driving wholly or partly along or across a footway. You would think that this position wouldn’t be questioned by anyone other than those adult cyclists who insist on cycling on footways. Unfortunately you’d be wrong: Galway City Council’s officials oppose our position. They hold a stated and repeated position that it’s not accurate to say it’s illegal to cycle on the footpath. Incredible, isn’t it. Bear in mind that this is also the council who brought you the infamous Doughiska Road cycle lane abomination. Under Irish law a bicycle is a vehicle, a cyclist is a driver and cyclists are considered to be traffic. Recognising this, the strategy affirms that the default assumption will be to provide for cyclists on the same carriageway surface as other vehicles. The council will work to ensure that cyclists have on-road solutions on all roads in the city. Equally the legal status of cycles means that it is illegal to cycle on footways. This letter uses a bullying tactic which is now favoured by Galway City Council officals when dealing with stubborn councillors; if you don’t vote for this we’ll lose the funding. This tactic has been used frequently to push through poorly conceived infrastructure schemes. It’s an affront to the democractic structures of local government and is an obscene use of our taxes. Schemes which are a waste of money and serve no road user (motorist, cyclist or pedestrian) get built simply to serve the egoes and CV building exercises of city council officials. The Road Traffic Acts are clear; it’s illegal to cycle on the footpath. We want that recognised by councillors in the face of bullying by city officials. 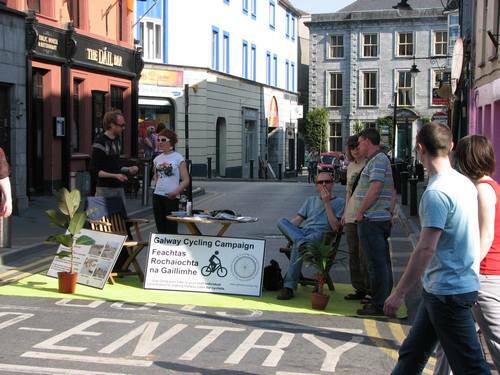 The Galway Cycling Campaign wishes to disassociate itself from the Galway Transportation Unit’s controversial Newtownsmyth one-way street experiment and is questioning claims that it was intended to benefit cyclists. 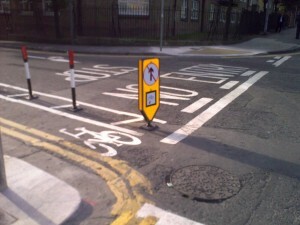 At the start of Bike Week 2010, the City Council announced a “contraflow” cycle lane in Newtownsmyth, a street that already has two-way traffic and where there was therefore no logical requirement or demand for contraflow cycling. 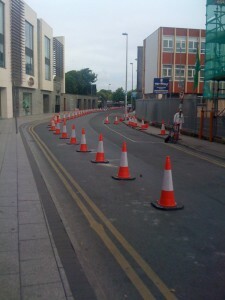 The Council did not consult the Cycling Campaign on this scheme. The Campaign is unlikely to have endorsed a scheme that had no formal benefit to cyclists and that did nothing to solve existing problem locations. In addition, we would never have supported a scheme whose execution demonstrably flew in the face of established best practice. The provision of two-way cycling on suitable one-way streets is a long-established and widely endorsed method for improving cyclist access and safety — one that was actually suggested for Galway in a report compiled in 1979. German cities like Bremen began providing two-way cycling on one-way streets in the early 1980s. In central Brussels, 60% of one-way streets are two-way for cyclists; in Liege, 70%. Belgian research indicates that the accident rate for cyclists is lower on these streets. In Ireland, as in Belgium, it is often possible to provide two-way cycling simply by putting up a sign at the entrance to the road. 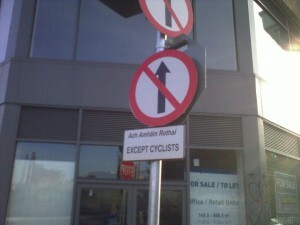 Irish traffic law was amended in 1998 so that in its simplest form, councils could provide two-way cycling by just adding an exemption plate ‘Except Cyclists — Ach Amháin Rothaithe’ to existing No Entry signs. 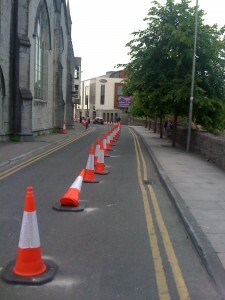 The provision of two-way cycling on one-way streets was adopted as a stated objective of the Galway City Development Plan 2005–2011, but there has been no sign of any attempt by the city council executive to meet this requirement. There are various one-way streets in Galway where this could have been piloted with minimal changes to road layout. 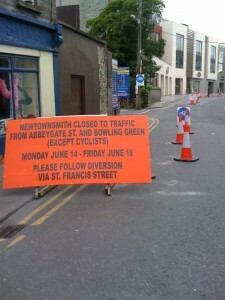 Instead, the street at Newtownsmyth was made one-way for a week and a “cycle track” was implemented by bolting an unsightly row of traffic cones into the street surface. The result was disruption to local businesses and users of the street, and the attendant criticism that was widely reported in the media. The 2007 bus study included a proposal to ban right turns from Newtownsmyth toward the courthouse. This suggests that the Newtownsmyth experiment was a test run for a long-planned extension of the city’s one-way street system, under the guise of a cycling scheme. Gateway treatment at entrance to one-way street. This is only necessary if there are formal no-entry markings. If there are just signs then an exemption plate is all that is needed. Bike week: Treasure Hunt a winner with the kids again in 2010! The 2nd Annual Family Cycling Treasure Hunt survived some initial summer showers to come out a clear winner with the kids yet again in 2010. An afternoon of cycling fun, training, exploration and adventure was had by over thirty families. 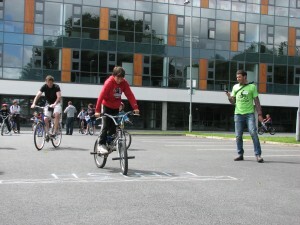 Starting from the Arts Millennium building in NUI, Galway and taking in some of Galway city’s most scenic routes, the treasure hunt used the university campus for traffic-free fun. Bikes had their NCT with Mike the bike doctor before setting off on the “Explorer” course, designed for smaller children and their adult supervisors. The “explorers” travelled through the university ground, along the River Corrib, and back to the main campus via Corrib Village. Educational questions, relating to cycling benefits and safety, were mixed with fun challenges, such as a slow bike race and cycle slalom. There was also cycling skills education with a qualified UK National Standard Cycling instructor. Older children finished with the longer “Adventurer” course; it incorporated the Explorer course and extended along Galway’s canal system, involving some on-road sections of Mill Street and New Street. Volunteers were present along the routes to offer help, stickers, friendly smiles and chats. After completing the courses, cyclists were treated to refreshments — fruit, chocolate, drinks, and a variety of delicious homemade muffins — until the prize draw took place at 4 pm. There were three prizes of vouchers for Nigel’s Cycles on the Tuam Road, and all the children got bells for their bicycles, courtesy of Richard Walsh Cycles on the Headford Road. The Galway Cycling Campaign would like to thank NUI, Galway for hosting the event, the Department of Transport for funding, Galway City Council for their assistance, and the many volunteers who helped make the 2010 Family Cycling Treasure Hunt such a success. The Campaign is very grateful to the Red Cross, who were on hand throughout the day, and to Critical Mass Galway, who provided enthusiastic volunteers. 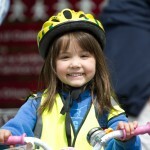 Most of all, we want to thank the cyclists of all ages who took part. We hope they enjoyed the event as much as we did, and we hope to see them again next year! Last Sunday 11 April, to celebrate World Health Day 2010 and Galway City Council’s decision to close Cross St. and Middle St. to motorised traffic for the afternoon, the Galway Cycling Campaign converted a small section of the road — the size of a single car — into a miniature public park for the people of Galway. It was the second time we created this mini-park in the city. By temporarily constructing Galway’s newest park, our aim is to creatively explore how urban public space is allocated and used. Inexpensive kerb-side parking results in more motor traffic and less space in our city centre. This in turn hinders the movement of pedestrians, cyclists, and motor vehicles; it adds to the level of CO2 emissions; and it obstructs the creation of a healthy, vibrant human habitat for Galway. We are re-imagining the possibilities of the city landscape. Our re-interpretation of road space demonstrates that even temporary spatial redesign can improve the character of Galway City. We were also lucky to have a beautiful sunny afternoon. Many curious passers-by stopped to chat, to sample our delicious bicycle biscuits, to sign up to our mailing lists, to read our educational signs and our new Cycling Skills leaflets, and simply to watch the world go by from an unexpected green patch on the road. We would like to thank Galway City Council for closing Cross St. and Middle St. to traffic for the afternoon, and we’re especially grateful to everyone who stopped and said hello. We’re already looking forward to the next outing of our mini public park!